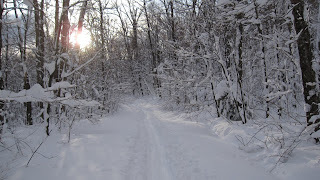 As expected, ski conditions on the Lake Placid to Keene section of the Jackrabbit Trail in Lake Placid are superb. With at least 30 inches of new snow in most places, the climb gets you warmed up and provides a nice aerobic workout. I like to go as fast as possible most of the time on the downhill sections, but some people like to make turns just because. Whatever floats your ski, the conditions are dee-luxe. 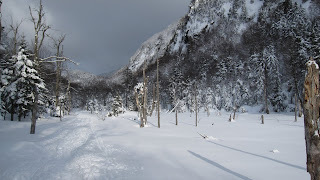 This section of the spectacular Jackrabbit Trail climbs up from Lake Placid, through the narrow valley that separates the back side of Pitchoff Mountain from the Sentinel Range, down to Keene, New York. An advanced intermediate ski, the ski trail passes through steep, narrow rocky sections and over frozen beaver ponds. 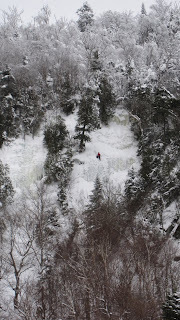 Skiers who reach the top beaver pond and are paying attention can usually spot the ice climbers on Pitchoff Mountain. Sometimes I hear voices echoing off the cliffs but the climbers are out of sight; a very funny feeling when you've been skiing along, marveling at the deep and muffled snowy silence! As you can see from yesterday's photos, it was a perfect Adirondack day (PAD).